I’ve been holding out on you. I know where the tastiest carrots in the Valley are and I haven’t told you yet. Let me just give you some clues. These carrots are organic. One of these farmers doesn’t wear shoes unless he really has to. Another is the smiling face behind their beautiful veggie stand at the Wolfville Farmer’s Market. And their son Nelson just opened a fabulous restaurant right behind Union Street Cafe called the Black Trumpet. So the barefoot grower of tasty carrots is Henry Penner of Goldfinch Farms. He and and his wife Dora grow an amazing variety of vegetables on their farm on Willow Avenue, practically in the town of Berwick. From salsify to parsnips to a rainbow of peppers and tomatoes, squash, leeks that would set world records for their size, parsley root, spinach, even peanuts, they grow it all without chemicals and with, it would appear, a lot of love. Henry and Dora now own the Rising Sun Health Food Store in Berwick, and they stock a fridge with their own produce. Henry will gladly fill orders for larger quantities if you just ask. Sawler’s carrots are also grown outside of Berwick and are widely available at grocery stores. They are the folks that produce a lot of the Valley’s cabbage, turnips and onions and keep the kid’s soccer program going! I love their trucks, retro green with red boxes. You are welcome to stop by their wholesale/retail outlet and stock up for winter (very inexpensively) at 189 Pleasant Valley Road. Just take Exit 15 off highway 101, head north, then take the very first right. 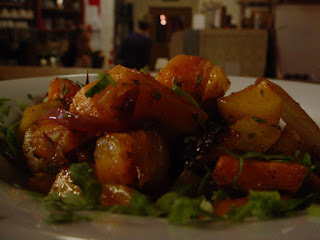 At the Cafe, we’ve been experimenting with Rainbow Carrots from Wilmar Acres. Marketed under the Country Magic label, they are a fun way to add colour and have great flavour, too! Today we made this wonderful salad for the buffet. Preheat oven to 400 degrees. Peel carrots, and cut into 1/2″ pieces. Place in a large bowl with the onion, olive oil and salt. Toss to coat the vegetables and spread onto a baking sheet. Roast for 35-40 minutes, stirring occasionally, until carrots have softened and are beginning to brown. Meanwhile, whisk the lemon juice, cumin, optional hot sauce, cinnamon, honey and parsley until combined. When the carrots are ready, scrape them back in the bowl with all their oil and toss with the dressing while still warm. Serve salad right away or chill until cold and serve, garnished with the pomegranate seeds and cilantro. So simple, but so yummy. Try this for Christmas dinner! Preheat oven to 400°. 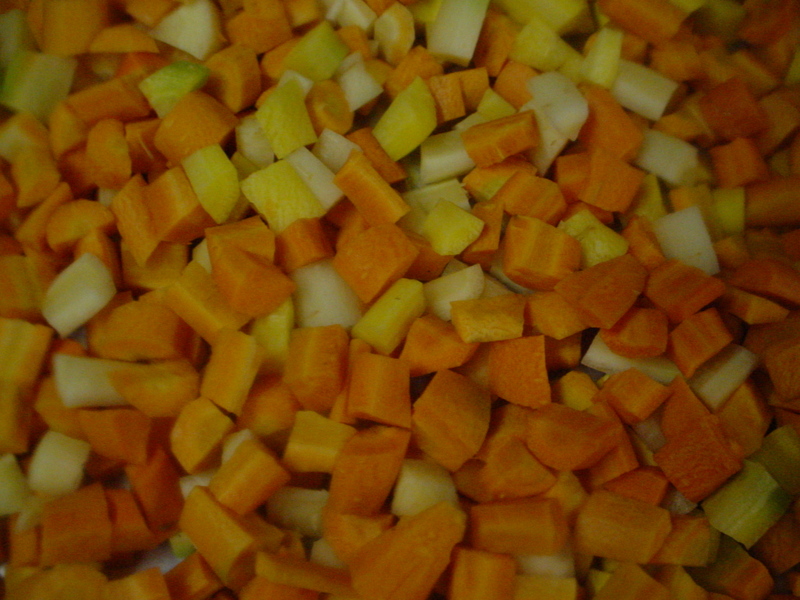 Chop the carrots into ½ inch chunks. Bring a pot of salted water to a boil and drop the carrots in, then reduce the heat and cover for about ten minutes, until carrots are tender. Drain and combine in a 9×13 pan with the butter and honey. Roast uncovered for 30-45 minutes, until carrots are glazed and browned.